Christmas just wouldn’t be Christmas without the good ol’ Christmas pudding(s)! If you didn’t know already, this Saturday (3rd December) will be my second Pud Inn event at The Rutland Arms. We’re looking forward to serving attendees five delicious ‘Christmas -themed’ puddings which will get you in the mood for Christmas. The full puddings menu will be revealed LIVE on twitter and Missie’s Facebook page Saturday (tomorrow) morning, from 9.00am – I hope those who have managed to purchase tickets will enjoy the five puddings I have in-store for you – I’ve enjoyed curating the menu list and a big thank you to the five sweetest ever pudding enthusiasts I know for taking part and making our wholesome puds. 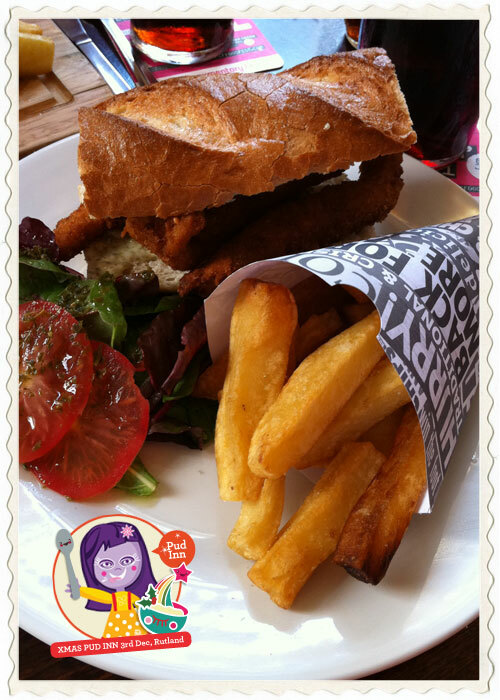 Sheffield's Rutland Arms 'Fishy fish finger butty' served with real chips! Make sure you get RT-ing and hash tagging (I’d hate you to miss out on a chance to win free food!). See you at the Pudding Club! (3pm – 6pm at The Rutland Arms).